The golden eaglets started like a house on fire with four first half goals, Musa Mohammed, Chidiebere Nwakali and Musa Yayaha all got on the scorer sheet. The Manu Garba led boys started from where they left off in the first half as substitute Chigozie Obasi's goal in the 90th minute made it five for Nigeria. Elsewhere in group F, Mexico defeated Sweden 1-0. With this results Nigeria top the group with 7 points followed by Mexico with 6 points while the Sweedes have 4 and Iraq finished with no point. Nigeria has now qualified for the round of 16 and will be facing the second placed team in group E.
Nigeria has not lost a group-stage game at any U-17 World Cup since way back in 1993. 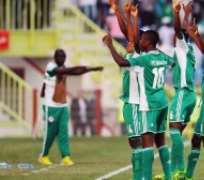 Meanwhile President Goodluck Jonathan has congratulated the Golden Eaglets of Nigeria on their 5-0 defeat of Iraq in the on-going FIFA under-17 world cup in the United Arab Emirates. President Jonathan urged them to maintain the exemplary dedication, commitment and resilience they have exhibited thus far in the competition until ultimate victory is achieved. He assures them of the support of the federal government as they continue in the competition.